The Amazing Shoemaker – Fairy Tales and Legends about Shoes and Shoemakers an Exploration of Shoes in Our Collective Immagination tells the life story of Salvatore Ferragamo, a personal history that already has all the essential ingredients of a fairy tale. It is an adventure that begins with a young boy’s passion for an ageold trade, lessons learned from other cobblers and our hero’s travels to a distant land where shoes hold fascinating and mysterious powers. 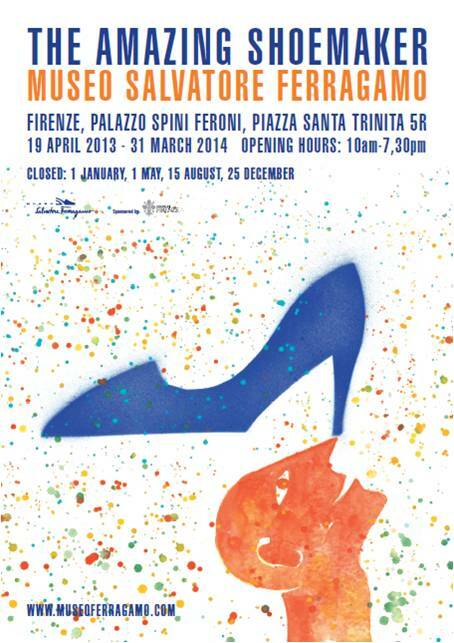 From 19 April 2013 to 31 March 2014, Museo Salvatore Ferragamo in Florence will host a new and important exhibition, The Amazing Shoemaker – Fairy Tales and Legends about Shoes and Shoemakers curated by Stefania Ricci, Sergio Risaliti and Luca Scarlini. In this exhibition, the museum explores the role that shoes play in fairy tales, myths and legends, which are very often centred around shoes and cobblers, as wearing shoes has historically been seen as a sign of wealth and power. The focus of this exhibition has stirred the interest of a number of writers and artists in myriad disciplines, who have enthusiastically contributed to the project with their own works of art. They include experts in children’s literature like Antonio Faeti and Michele Rak; film historians like Alessandro Bernardi, and writers and poets like Hamid Ziarati, Michele Mari and Elisa Biagini who have written new fairy tales specifically for this project, with illustrations by Michela Petoletti and Francesca Ghermandi. In addition, renowned composer Luis Bacalov has written original music for the exhibition ouverture, while young photographers Simona Ghizzoni and Lorenzo Cicconi Massi, together with expert photographer Arrigo Coppitz, have photographed Salvatore Ferragamo shoes in fairy tale settings. The participation of so many artists has led to a unique and magical portrayal of the world of shoes in which Annette Lemieux’s work of art, entitled Messenger, is compared to the myth of Mercury, while the artwork by Carol Rama is seen as a more extreme version of Cinderella and Daniel Spoerri’s work is compared to Hop-o’-My-Thumb. Other artists have chosen to create new art inspired by various fairy tales: Liliana Moro looked to Donkey Skin; Ann Craven to Cinderella, Puss in Boots, Alice in Wonderland and The Wizard of Oz; Timothy Greenfield–Sanders to The Wizard of Oz; Liu Jianhua to Cinderella; and Jan Svankmajer to The Red Shoes. An entire section of the exhibition is devoted to the sculptures and drawings of Mimmo Paladino. This artist, from Italy’s Campania region, has collaborated on an original animated story with writer and comedian Alessandro Bergonzoni, author of a visionary tale.Frank Espinosa – the creator of famous comics like Rodcenko – has penned the illustrated story of Salvatore Ferragamo’s adventures. Finally, two short films complete the project. In the first, directed by the Italian director, Francesco Fei, the shoe is cast as an essential part of the hero’s accoutrements, needed for his travels into the kingdom of the dead, as in the tales of Native Americans. The second is an animated short inspired by an episode in the life of young Salvatore Ferragamo, created by two masters of fantasy film: Mauro Borrelli, the storyboard artist for hit films like The Adventures of Baron Münchausen by Terry Gilliam and Dracula by Francis Ford Coppola, and Rick Heinrichs, the Oscar-winning screenwriter of Tim Burton’s Sleepy Hollow. The exhibition will also include rare volumes from the National Libraries of Rome and Florence and the Marciana in Venice, as well as the priceless manuscript by Federico García Lorca, La zapatera prodigiosa, on display for the first time in Italy. There will also be masterpieces of art, including Giambologna’s sculptures of Mercury, god of the winged sandals, from major Italian and international museums. I love fairy tales. Magic, mysteries, powers are still my cup of tea. Thank you for telling me about another good story about Salvatore Ferragamo. I would love to hear more from you. Keep writing such interesting blog posts.